The seven current members of the Justice League will have plenty of company next year. The Continuum has learned there will be many guest-stars in the new season of the Cartoon Network series, which is currently in the works at Warner Bros. Animation. Among the heroes appearing next season will be Red Tornado, Green Arrow and Black Canary. Also appearing will be the Atom, in which sources say, is an episode written by Warren Ellis. Contacted by The Continuum, Ellis on Tuesday said he could not confirm his involvement in the show. "Secret Origins, Pt. 1" on Monday, Jan. 5; "Secret Origins, Pt. 2" on Tuesday, Jan 6; "Secret Origins, Pt. 3" on Wednesday, Jan. 7; "Hearts and Minds" on Saturday, Jan. 10. "In Blackest Night, Pt. 2" on Monday, Jan. 12; "The Enemy Below, Pt. 1" on Tuesday, Jan. 13; "The Enemy Below, Pt. 2" on Wednesday, Jan. 14; "Injustice for All, Pt 1" on Thursday, Jan. 15; "A Better World" on Saturday, Jan. 17. "Injustice for All, Pt. 2" on Monday, Jan. 19; "Paradise Lost, Pt. 1" on Tuesday, Jan. 20; "Paradise Lost, Pt. 2" on Wednesday, Jan. 21; "War World, Pt. 1" on Thursday, Jan. 22; "Eclipsed" on Saturday, Jan. 24. * Look for more Justice League news soon here in The Continuum. For covers and four-page previews of DC Comics titles arriving in stores on Wednesday, Dec. 3, CLICK HERE. Titles include The Authority #8, Batman: City of Light #3, Detective Comics #789, Formerly Known as the Justice League #6, Hawkman #22, JSA: All-Stars #8, Plastic Man #1 and Y: The Last Man #17. Artist Sean Chen told The Continuum that his next project for Marvel will be X-Men: The End, another in a series of Marvel projects involving the final stories of its characters. X-Men: The End will be written by Chris Claremont, but, beyond that, Chen said details of the project are sketchy. The series figures to start in the spring and could be quite lengthy. "Chris has so many ideas that the joke is that it will be an ongoing, but it has to end, right?" 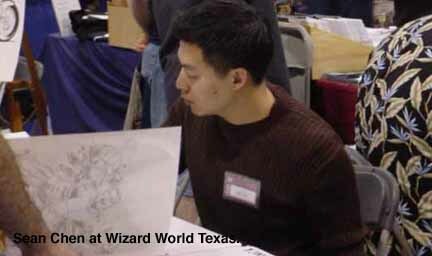 Chen said last weekend at Wizard World Texas. "I think they settled on 16 issues. It's Marvel's biggest franchise and it's going to take a long time to wind down." Although Chen had a stint on Wolverine, this is really his first full chance to draw the X-Men as a group. "I'm definitely excited. This is definitely the biggest thing I've been involved in in comics," Chen said. "I don't want to drop the ball. "This has a chance to be one of the greatest stories in comics, who walks off into the sunset, who dies and all of that." With the release of X2 on DVD on Tuesday, The Continuum presents excerpts from a recent convention panel attended by writers David Hayter and Michael Dougherty and director Bryan Singer. The second season of the Teen Titans animated series will begin Saturday, Jan. 10 on Cartoon Network. The show will remain in its 9 p.m. (ET/PT) time period for the new season. In the new season Robin, Cyborg, Beast Boy, Starfire and Raven will be joined by Terra, a powerful young girl with the ability to move mountains. Guest appearances in the new season will come from Speedy, Aqualad, Wildebeest and Warp. Returning villains include Gizmo, Plasmus, Cinderblock, Overload and the Titans� arch-nemesis Slade. Episodes include "How Long is Forever" on Jan. 10; "Every Dog Has His Day" on Jan. 17; "Terra" on Jan. 24; and "Only Human" on Jan. 31. DC Comics on Tuesday unveiled its collected editions from Vertigo for early 2004. In other DC news, the publisher announced that Gregory, the series of four hilariously poignant one-shots written and drawn by Marc Hempel, will return in March in the first of two black-and-white, manga-sized collected editions. "It's great that DC is putting this material back into print," Hempel said. "People constantly come up to me at conventions to ask where they can find copies of Gregoy! I mean, how many comics from 1989 are even remembered, let alone still in demand? Even after all these years, the little lunatic has a manic and devoted following. All I can say is that for me, Gregory was a labor of love. And I'm thrilled that not only will longtime fans be able to replace their worn out (or lent out and never returned) original copies, but a new generation of readers will have the opportunity to discover these stories for the first time." A Gregory Treasury Volume 1 collects stories from Gregory and Gregory II: Herman Vermin's Very Own Best-Selling & Critically Acclaimed Book with Gregory in It, written by Hempel with art and a new cover by Hempel. The book will be a a black-and-white trade paperback measuring 7 3/8" x 5" and is suggested for mature readers. It will cost $9.95. Tom Welling said that his first feature film role, in the Christmas comedy Cheaper by the Dozen, is different than playing Clark Kent in Smallville. Welling plays the role of Charlie, the oldest son who is unhappy about being uprooted from his hometown high school and girlfriend, in the film starring Steve Martin. "Cheaper by the Dozen is a fun story," Welling said, "with a lot of great elements -- and very different from what I do on TV. I liked the idea of being a part of a large cast, and I love kids. I knew I could learn a lot from Steve Martin." According to director Shawn Levy, your stars like Welling, Piper Perabo and Hillary Duff embraced being part of a creative ensemble. Above is a first look at the banners for the Hellboy movie that should start appearing in theaters in the next 10 days. Click on the thumbnails for larger images and look for more Hellboy news this week here in The Continuum. Dynamic Forces has provided The Continuum a first look at the Dreadstar hardcover that ships in April. The book. which costs $69.99. collects the first 12 issues of Jim Starlin's run, originally published in 1982. Look for the first trailer for Spider-Man 2 to be on the film's official site on Dec. 15. * For Saturday, Nov. 1, including Hellboy movie news, CLICK HERE. * For Friday, Oct. 31, including Marvel news, CLICK HERE. * For Thursday, Oct. 30, including IDW news, CLICK HERE. * For Wednesday, Oct. 29, including Marvel Comics movie news, CLICK HERE. * For Tuesday, Oct. 28, including Marvel Comics movie news, CLICK HERE. * For Monday, Oct. 27, including Marvel Comics solicitations, CLICK HERE. * For Saturday, Oct. 25, including Image Comics solicitations, CLICK HERE.